Calla is a magnificent ornamental plant from the family of Araceae. These surprising plants with beautiful leaves and marvelous flowers came to us from the South Africa. The area of growth of a calla stretches from moderated to tropical belts of the northern hemisphere. These plants in the nature grow on coast of reservoirs of the rivers, in marshy places. Quite often callas are used in landscaping. Flowers of a calla in itself medium-sized and not too attractive, but possess the exciting aroma very reminding vanilla. 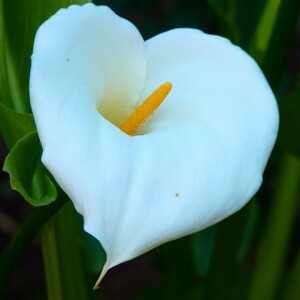 All callas can be divided into two big groups. Carry so-called "white" large flowers to the first. And representatives of the second group – "color" callas. These callas are smaller, but motley. Calla. Calla cultivation. All about plant.